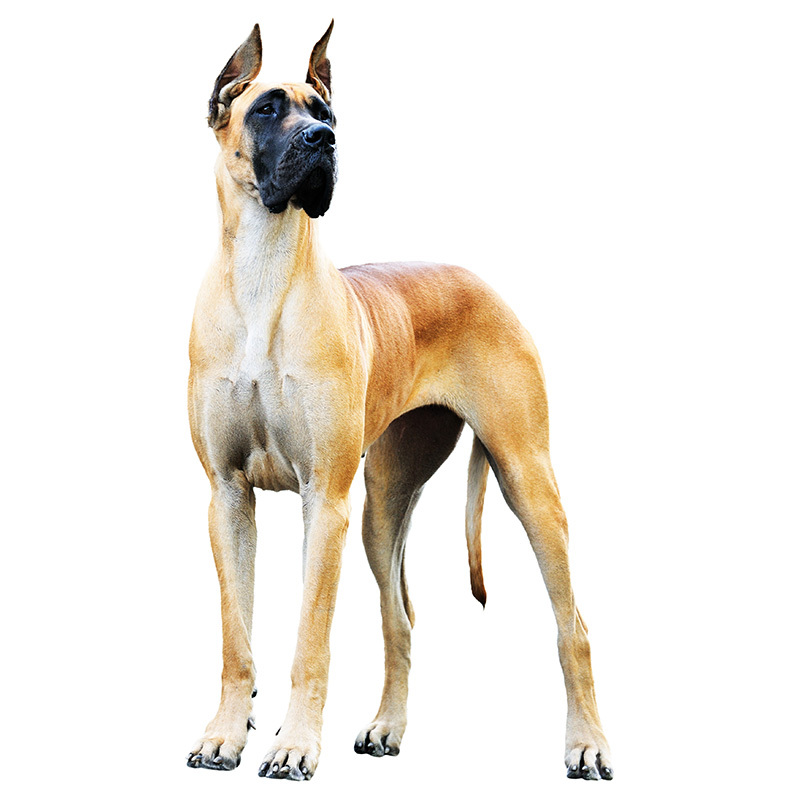 Known as the "Apollo of all dogs," dogs resembling the Great Dane date back to 36 B.C. It is thought that Wolfhounds were mixed with Old English Mastiffs to create the present day Great Danes. As well as being used to bring down bear and wild boar, they were also used as estate guard dogs. When a French naturalist traveled to Denmark and saw a version of the Boar Hound, he called it Grand Danois, which eventually became Great Danish Dog. The name stuck, even though Denmark did not develop this breed. Most breed historians give German breeders credit for refining the Great Danes as we know them today. They are given great credit for their efforts to produce a gentle dog, as Great Danes were originally very aggressive with ferocious temperaments. Often called a "gentle giant" and the "king of dogs", Great Danes are charming and affectionate. They love everyone, and are especially patient with children. Great Danes are reliable, trustworthy, dependable, and have a great disposition. They make great watchdogs, as they are courageous and loyal. They are bred as exceptionally large companion dogs and are gentle, friendly, and docile. Good natured as they are, Great Danes still need early socialization and training, as do all dogs. This will help them to grow up and be a well-rounded dog. Great Danes usually weigh 110 to 175 pounds and stand approximately 31 to 36 inches tall. They are a very large dog with a powerful but sleek build. Their coat is extremely short and ranges in color from fawn to black to harlequin. The most famous Great Dane in all the world is none other than the cartoon character Scooby Doo. His name comes from a Frank Sinatra song where Scooby-dooby-do was repeated over and over again.